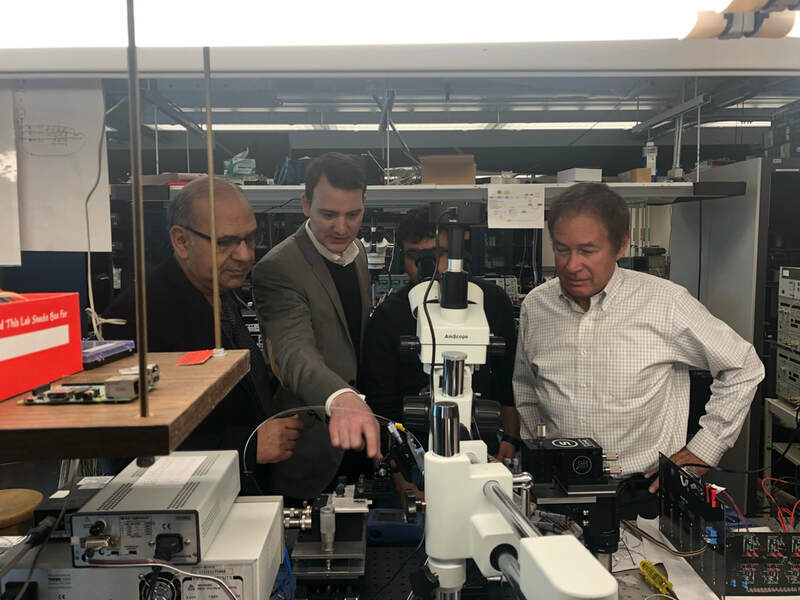 Prof. Sorger and Prof. El-Ghazawi with the team visited Prof. Paul Prucnal and Prof. Bhavin Shastri in Princeton University for the NSF/SRC E2CDA grant. Prof. Volker Sorger (ECE) was awarded a Research Equipment Award titled "Multilayer Heterostructure Prototyping Within Seconds & Integrated Optoelectronics Device Test System" by AFOSR for $100,000 and by ARO for $90k. 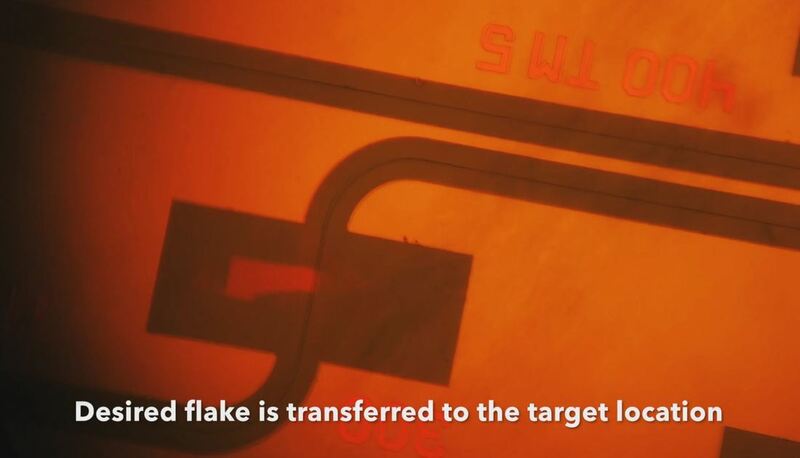 We demonstrate a novel method of transferring 2D materials resembling the functionality known from printing; utilizing a combination of a sharp micro-stamper and viscoelastic polymer, we show precise placement of individual 2D materials resulting in vanishing cross-contamination to the substrate. Prof. Volker Sorger (ECE) was awarded a SBIR Phase II grant award entitled "Toward Ultra-Dense Integrated Plasmonic Circuits" under the lead of Omega Optics Inc. sponsored by AFOSR with $210,000 portion to GWU. Rubab's paper with the entitled "Waveguide–based Electro-absorption Modulator Performance: comparative analysis" has been selected as Editor's Pick. Editor's Picks serve to highlight articles with excellent scientific quality and are representative of the work taking place in a specific field. In this event, the President of the SPIE student chapter Mr. Shuai Sun gave a talk about the fundamental physics and optics behind both classic (film) and modern cameras, mainly focusing on how cameras manipulate and capture the light and how the exposure triangle influences the photo captured by the sensor. Moreover, he discussed some of the main photography types and link the related camera settings with the fundamental optics. 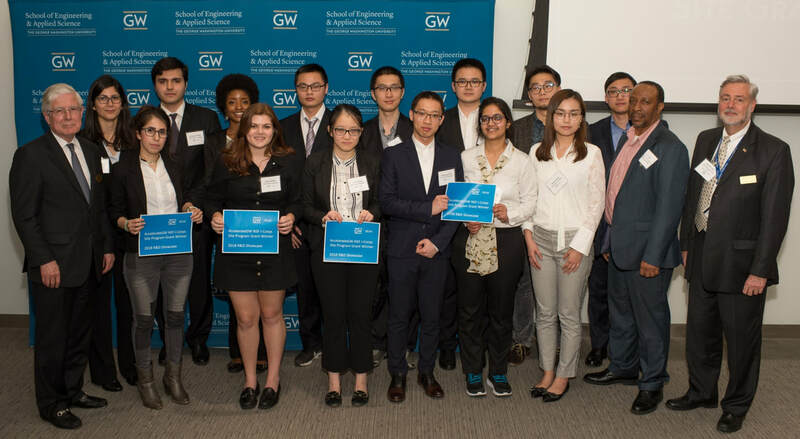 Shuai and Ruoyu paticipated the 2018 GWU Research Days and both won the 1st place (tie) of the GWNIC Award for Microscopy and Nanofabrication Techniques! This award is sponsored by the GW Nanofabrication and Imaging Center. ​Ruoyu also won the AccelerateGW I-Corps grant. Congratulations! Shuai won the second place and the AccelerateGW I-Corps grant in 2018 R&D showcase! Shuai won the second place (tie) of the 2018 SEAS R&D showcase competition in the Theoretical Research category with the title "Breaking the Boundary between Optical Communication and Data Processing" with $4,000 award. Also, Jiaxin and Shuai (co-author) won the other second place (tie) in the Theoretical Research category with the title "Residue Number System Arithmetic Based on Integrated Nanophotonics" with $4,000 award. In addtion, Shuai also won the AccelerateGW I-Corps Site Program Grant ($3,000) for commercializing his reseach project. Profs. 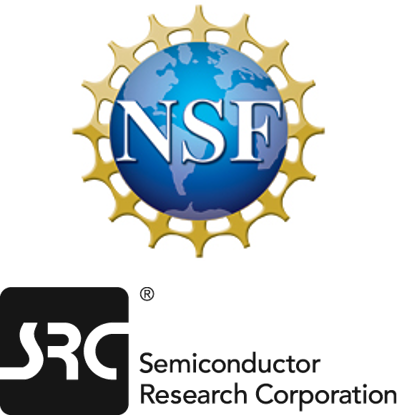 Volker J. Sorger and Tarek El-Ghazawi (ECE) as the PI and co-PI, are funded jointly by the National Science Foundation and the Semiconductor Research Corporation (SRC) with a 3-year $1,330,000 grant. ​Profs. Volker J. Sorger and Tarek El-Ghazawi (ECE) are the principal investigator and co-principal investigator, respectively, on a three-year, $1,330,000 grant funded jointly by the National Science Foundation and the Semiconductor Research Corporation (SRC) under the highly competitive and prestigious Energy-Efficient Computing: from Devices to Architectures (E2CDA) program. The project is titled “Collaborative Research: Nanophotonic Neuromorphic Computing.” Profs. Sorger and El-Ghazawi are collaborating on the grant with Prof. Pruncal (Princeton University). The E2CDA program addresses the problem that future performance improvements across the board are now severely limited by the amount of energy it takes to manipulate, store, and transport data. 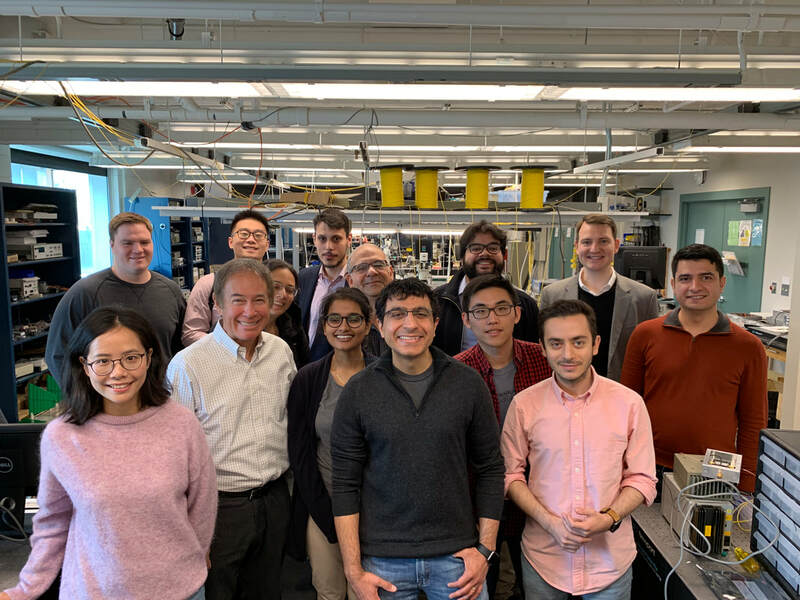 Under this innovative and interdisciplinary project, the PIs will develop future nano-photonic neuromorphic processors, inspired by the brain. This project is a part of a longer range vision and direction by Profs. El-Ghazawi and Sorger to achieve orders of magnitude improvements over today’s computing technologies through nano-photonic-enabled computing (NEC), using innovative principles for processing and architectures that depart from the traditional von Neumann digital computer systems and their limitations. 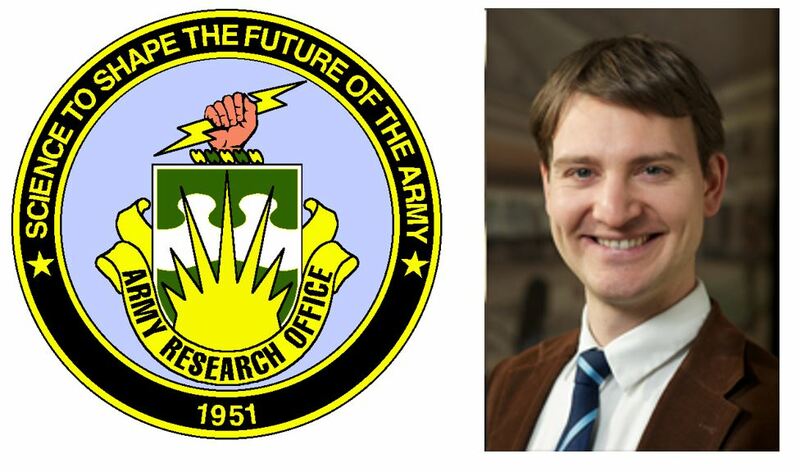 Prof. Volker J. Sorger (PI) recently received a new 3-year $880,000 grant from Air Force Office of Scientific Research. Prof. Volker J. Sorger (ECE) is the PI for a newly received Air Force Office of Scientific Research grant titled “From Direct Optical to Field-Induced Modulation of Photonic Modes Enabled by Novel 2D Materials.” The total award amount for this three-year grant is $880,000. The project is a collaborative effort with Prof. Bartels of UC Riverside. ​Prof. Tarek El-Ghazawi (ECE) and Professor Volker J. Sorger (ECE) are the principal investigator and co-principal investigator, respectively, on a four-year, $900,000 grant funded by the National Science Foundation (NSF). ​The project is titled “RAISE: The Reconfigurable Optical Computer (ROC)”. The ultimate goal of this bold interdisciplinary project is to engender a new class of reconfigurable computing devices. 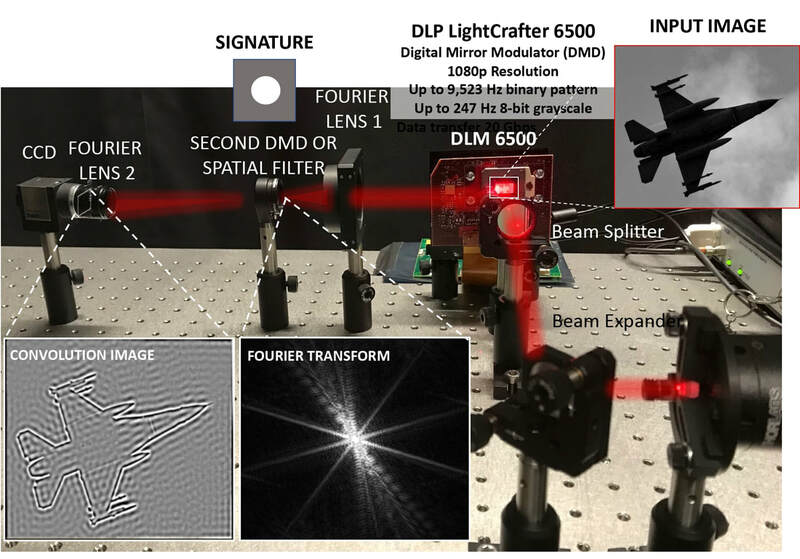 In specific, the objective is to create a nanophotonic analog reconfigurable computer (ROC) that is capable of computing out of first principles by solving those partial differential equations (PDEs) that are used for most simulations in science and engineering. The PDEs would be directly solved using a network of electric components that are implemented using innovative nanophotonic devices. Due to its transformative and interdisciplinary nature, this project is jointly funded by the Engineering and CISE Directorates in NSF. ​Together with the Omega Optics Inc., Prof. Volker Sorger (ECE) has been awarded a Phase I SBIR grant from AFOSR entitled “Toward Ultra-Dense Integrated Plasmonic Circuits.” His role will be as a consultant in Phase I of the grant. The funding amount for the nine-month grant is $225,000. 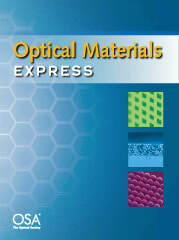 Prof. Sorger has been invited to be the Guest Editor of ​Optical Materials Express (OMEx) feature issue on planar oxide photonic materials.Papers will cover recent advances in the area of planar oxide photonic materials and devices. Congratulations on Prof. Sorger winning the Gold Metal - Best Presentation Award on the poster presentation at the 14th US-Korea Forum on Nanotechnology, hosted by NSF and Korea Ministry of Science, Sept. 11-12, 2017. 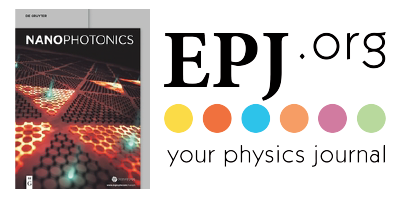 ​The journal enjoys a high impact factor of 5.7, one of the highest in the fields of optics and photonics. Nanophotonics covers recent international research results, specific developments in the field and novel applications. It belongs to the top journals in the field. Nanophotonics focuses on the interaction of photons with nano-structures, such as carbon nano-tubes, nano metal particles, nano crystals, semiconductor nano dots, photonic crystals, tissue. The journal covers the latest developments for physicists, engineers and material scientists. Prof. Sorger and Shuai attended the OSA Advanced Photonics Congress 2017 held in New Orleans. Prof. Sorger gave a talk in IPR about "Sub-voltage Graphene-Plasmon Based Electro-absorption Modulator", Shuai gave two talks in IPR and PS with the topics "Fundamental Physical Scaling Laws of Nanophotonics" and "High Performance Photonic-Plasmonic Optical Router: A Non-blocking WDM Routing Device for Optical Networks". Shuai also attended the joint poster section with the poster title "CLEAR: A Holistic Figure-of-Merit for Electronic, Photonic, Plasmonic and Hybrid Photonic-Plasmonic Compute System Comparison". Prof. Volker Sorger has been ​elevated to senior member for OSA, SPIE, and IEEE! Congratulation Volker on the senior memberships of OSA, SPIE and IEEE. ​The George Washington University (GW) and the Office of the Vice President for Research (OVPR) are committed to encouraging and supporting excellence in research and scholarship and recognizing those who have accomplished it. Nominations are now being accepted for the Distinguished Researcher Award, the Distinguished Scholar Award, the Early Career Researcher Award and the Early Career Scholar Award. The Researcher Awards is for those who conduct scientific research (e.g., in engineering, medicine, public health, psychology, nursing, among other fields and disciplines). The Scholar Award is geared toward faculty who work in social sciences, the arts and humanities. ​The two Ambassadors Dr. Alessandro Restelli and Dr. Arlene Smith talked about their experience of transitioning to an early career professional as well as the advice they have for members of the student chapter. Shuai won the 2nd prize of the 2017 TCO Innovation Competition with $5,000 award money! The Technology Commercialization Office strives to enhance research, innovation, and entrepreneurial spirit among the George Washington University (GW) research community. 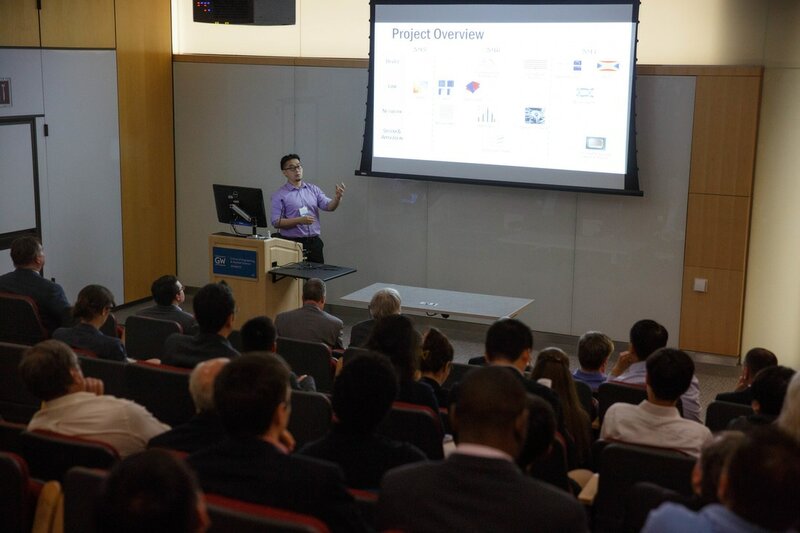 This event provides a forum for idea sharing between GW researchers, entrepreneurs, and members of the venture community, as well as the opportunity to present technologies to a panel of experienced entrepreneurs, investors, and industry professionals. 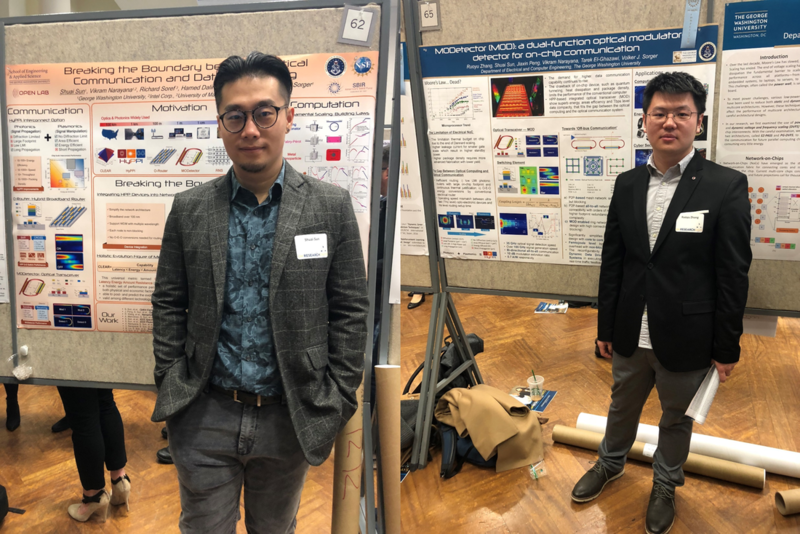 Shuai and Hani participated this event and presented their recent works about Hybrid Photonic-Plasmonic Interconnect and On-chip Optical FFT design. Hani won the 3rd prize of Student Poster Competition in Optics and Photonics. 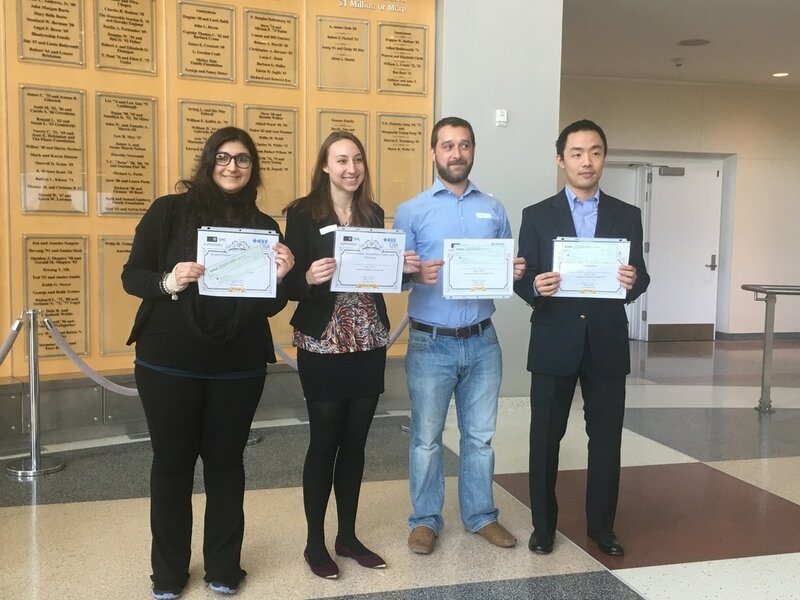 Hani won the 3rd prize of Student Poster Competition in Optics and Photonics held in University of Maryland, Collage Park. Zhizhen won a travel grant from NSF! Zhizhen (Matt) won a travel grant from NSF to attend the Mathematical Modeling of 2D Materials held in May at Minnesota University. Shuai and Hani won prizes in the GW 2017 Research Days! Shuai and Hani participated the GW 2017 Research Days on April 4. Shuai won the 1st prize in the Computational and Environmental Science category with the poster title "Hybrid Photonic-Plasmonic Interconnect (HyPPI): Tracing Moore's Law in a CLEAR Way". Hani won the innovation prize with the poster title ""Integrated All Optical Fast Fourier Transform (OFFT) On Chip with Heating Tunability- Design and Simulation Analysis. ​Congratulate Shuai Sun on wining the Entrepreneurship Award of the 2017 SEAS R&D Showcase! Shuai participated the 2017 SEAS R&D Showcase and won the Entrepreneurship Award with $2,000 prize money. ​His presentation with the title "Hybrid Photonic Plasmonic Interconnect (HyPPI): The New Path of Moore's Law in CLEAR Light" mainly talks about a holistic figure of merit (FOM) termed Capability-to-Latency-Energy-Amount-Resistance (CLEAR) to adequately compare the recent technology paradigms which not only includes the components count, but also considers the communication delay, energy efficiency, on-chip scaling and also the economic cost of a interconnect. Moreover, it accurately and equitably postdicts the technology developments since the 1940’s until today, and predicts photonics as a logical extension to keep-up the 2x/year pace of information-handling machines. At last, since this FOM is derived bottom-up, it is able to provide remarkable adaptability to applications ranging from device- and link-level to network- and system-level. Applying CLEAR to benchmark the performance under these levels against fundamental physical compute and communication limits shows that HyPPI is competitive even for fractions of the die-size, thus making a case for on-chip optical interconnects and network applications. 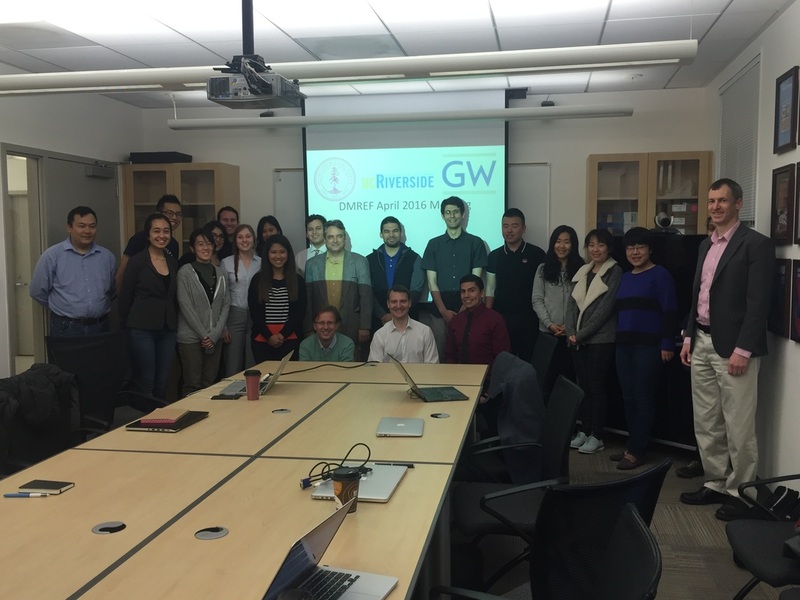 OPEN Lab participated the 11th GWU SEAS R&D Showcase! 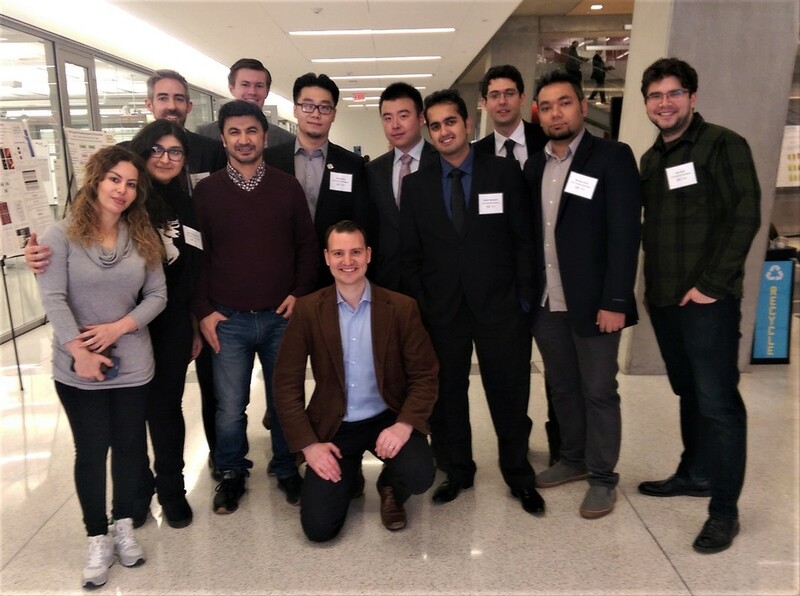 Hani Nejadriahi, Johnathan George, Joseph Crandall, Shuai Sun, Zhizhen Ma, Rohit Anil Hemnani, Mohammad Tahersima, Rubab Amin (from left to right) from the OPEN Lab attended the 2017 SEAS Student R&D Showcase held on February 22 at the GW Science and Engineering Hall (SEH) and presented their recent projects. The R&D showcase this year has 118 posters and over 40 judges from different departments of SEAS such as Biomedical Engineering, Computer Science,Civil & Environmental Engineering, Electrical and Computer Engineering and Engineering Management & Systems Engineering. The total prize money for this competition is $48,000. Dr. Sorger gave a talk at MIT, AIM Photonics Fall 2016 Meeting. He introduced some of the emerging materials such as ITO, geraphene with the advantages achieved by hybridizing photonics with plasmonics and device scaling. Moreover, Sorger also introduced the application in the optical computing field with these novel devices. Dr. Andrea Alu visited the OPEN lab and gave a talk at SEH! We are glad to have Dr. Alu from the University of Texas at Austin with us here today. 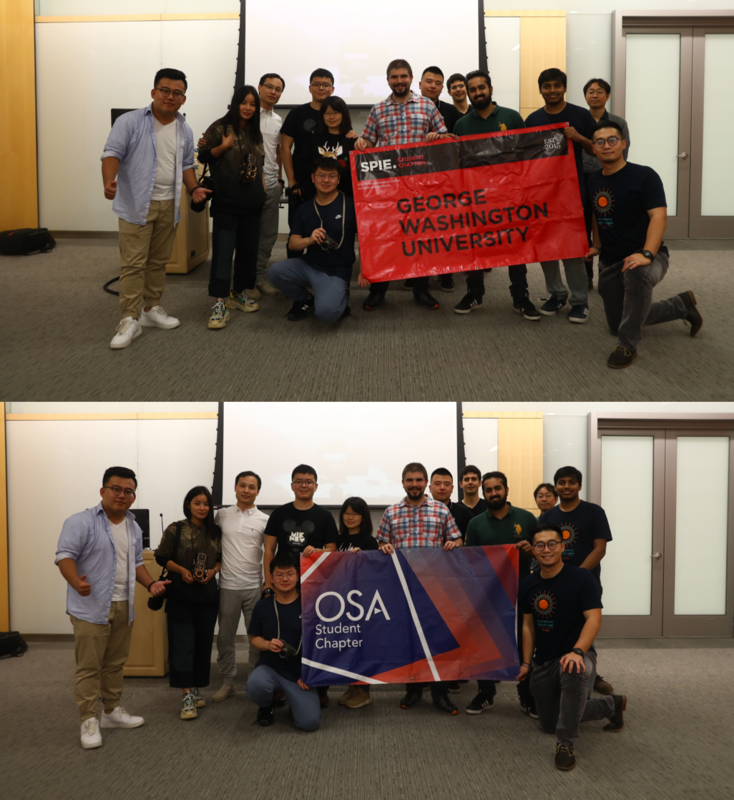 His talk on metamaterials and antennas was inspirational and instructive- we take this as a great success for the OSA/SPIE Student Chapters at GW and hope to have more amazing opportunities in our future endeavors. His topic metamaterials are artificial materials with properties well beyond what offered by nature, providing unprecedented opportunities to tailor and enhance the interaction betwenn waves with materials. Physical insights into these new devices and their impact on technology are discussed during the talk. Prof. Volker Sorger gave a talk at IONS this November with the title 'From Engineer to Career: How to Become a Successful Professional'. Hani received the CMC Microsystems Active Silicon Workshop Certificate! 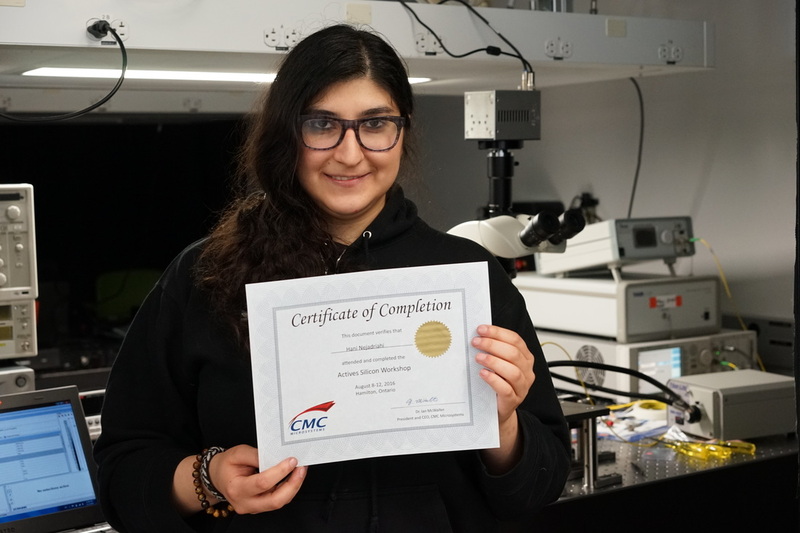 Congratulations to Hani receiving the CMC Microsystems Active Silicon Workshop Certificate. In partnership with the University of British Columbia and the NSERC CREATE Silicon Electronic-Photonic Integrated Circuits (Si-EPIC) Program, CMC Microsystems provided this opportunity for training in the design, fabrication and test of photonic integrated circuits (PICs) targeting IME's silicon-on-insulator (SOI) technology. This technology enables both active and passive photonic devices to be monolithically integrated on the same chip. This training was a stand-alone learning opportunity for research development in optical communication and computation. Learn more about this Actives Silicon Photonics Workshop and the Si-Epic program. Prof. Volker Sorger wins the 2016 Hegarty Award for Innovation! Congratulations to Prof. Volker Sorger winning the 2016 Hegarty Award for Innovation! This is the second year of this award. It was created by Aran Hegarty and his wife Fritz. Aran is a SEAS alumnus (MS, 1997) and has been a NAC member since 2011. The award, which is $10,000, is to recognize and reward a faculty member for innovation. Prof. Volker Sorger (ECE) and his team received a $620,000 grant from ARO! Prof. Volker Sorger (ECE) and his team received a three year $620,000 research grant from the Army Research Office (ARO) entitled "2D Material-based electro-optic modulation on a Silicon Platform". Dr. Sorger is the lead PI of this collaborative program joining forces with Prof. Agarwal (UPenn). The 2016 Nano@GW event is coming! The 2016 Nano@GW event is going to be hold at Lehman Auditorium, SEH, GW on July 8, 2016. This year is an exciting topic on NANOLASERS, the smallest laser devices of the world. We co-host this event with OSA Incubator. The goal of this Incubator is to forge connections between the diverse communities working on different approaches to nanolasers in order to identify fundamental goals and limits for nanolaser research, identify potential applications for nanolasers and identify a roadmap for nanolaser research that can bring the science closer to commercialization. For more details, please check the website link. Mohammad awarded an SPIE Optics and Photonics Education Scholarship! 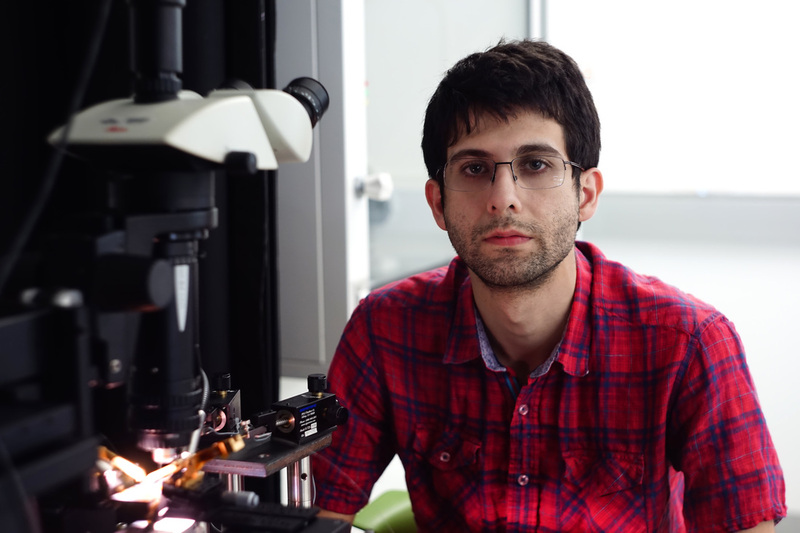 Mohammadhossein Tahersima has been awarded a 2016 Optics and Photonics Education Scholarship by SPIE, the international society for optics and photonics for his potential contributions to the field of optics, photonics or related field. Professor Volker Sorger wins the 2016 Outstanding Young Researcher Award! Prof. Volker Sorger is an outstanding researcher, scholar, and entrepreneur who has laid solid foundations for a distinguished career. He has published over 80 research articles that were cited 3700 times according to Google Scholar. His publications have appeared in some of the most prestigious venues including the Nature Publishing Group and Science. He has secured 6 research grants from prestigious U.S. funding agencies, including NSF and AFOSR, totaling over 2.4 Million Dollars. In addition, he won a total of 18 awards and prizes including the prestigious Air Force Office of Scientific Research Award, and was nominated for the Presidential Early Career Award in Science and Engineering given by the White House. 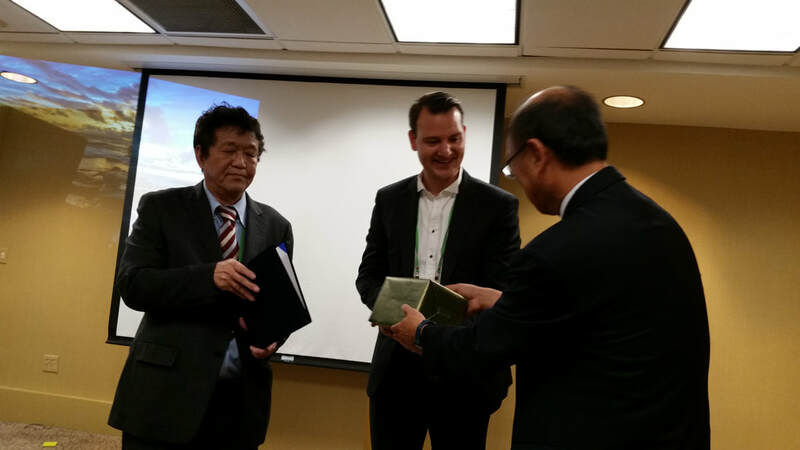 He disclosed six (6) patents and recently licensed results of his PhD study for multi-million dollars to industry. Sorger is truly a young leader in his field and as such he is serving as the editor-in-chief of a leading journal and a board member of the Optical Society of America (OSA). Meeting with NSF DMREF grant collaborators at Stanford! 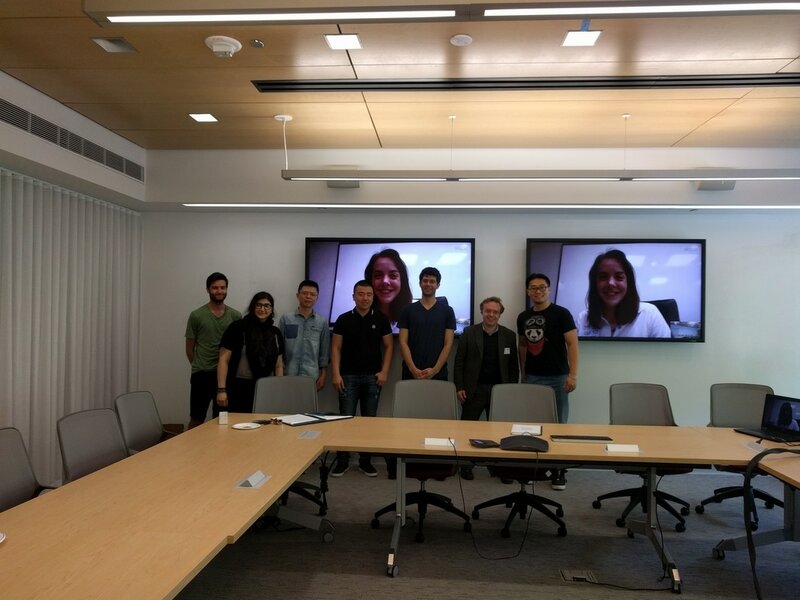 Volker, Mohammad, and Zhizhen organized and met with NSF DMREF grant collaborators from Prof. Bartels and Prof. Reed's group at at Stanford University on this Friday, May 29. Shuai won the 2nd prize of GW Research Days 2016 in the area of Engineering! 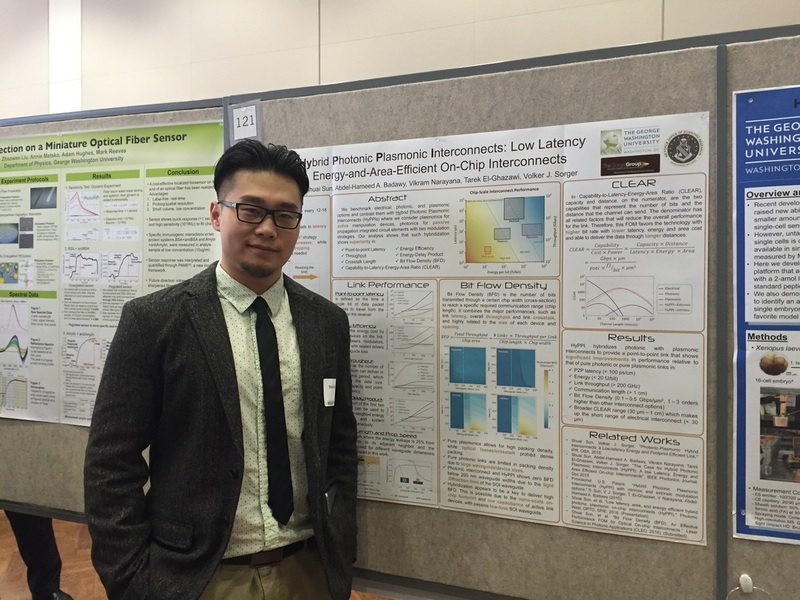 Shuai participated the GW Research Days 2016 in Marvin Center on March 29. 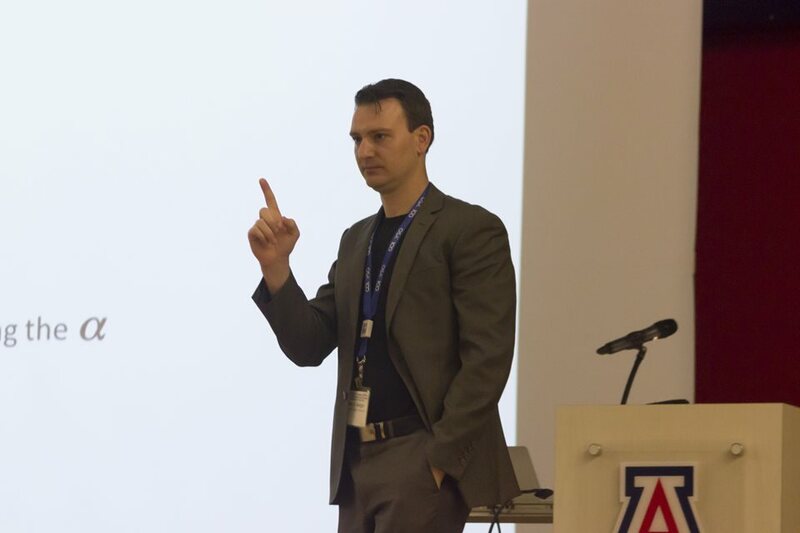 He presented one of his recent research with the title "Hybrid Photonic Plasmonic Interconnects: Low Latency Energy-and-Area Efficient On-Chip Interconnects" and won the 2nd prirze in the Engineering category. Research Days invites GW undergraduate, graduate, and postdoctoral students to showcase their work and compete for prize money at the 21st Annual Research Days. This annual event is dedicated to highlighting the breadth of research and discovery on issues of major disciplinary, multidisciplinary, and global significance being done at GW through poster sessions, presentations, guest speakers. Prof. Nader Engheta visited the OPEN lab and gave a talk at SEH! 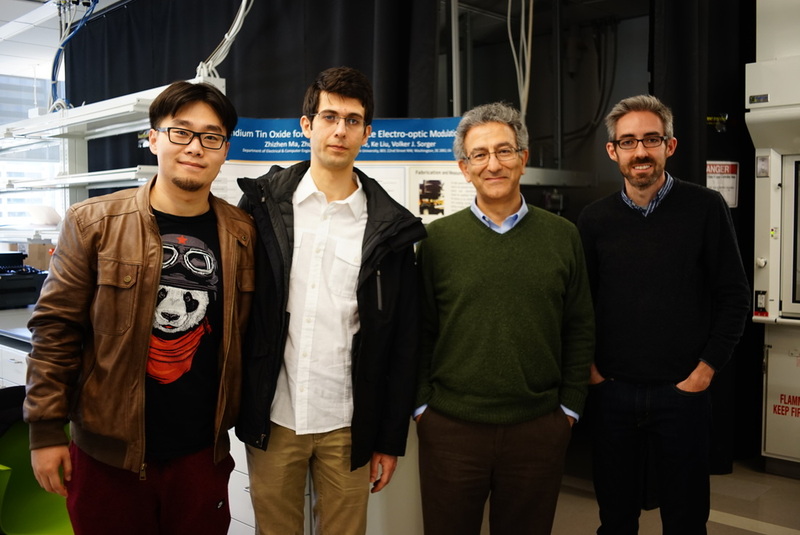 Prof. Nader Engheta visited the OPEN lab on March 2, 2016. Volker gave him a good tour around our lab and SEH facilities. Also Zhizhen, Mohammad, Jonathon and Shuai presented their recent project to Nader. After lunch, Nader gave a talk with the potic "Optics at the Extreme" for the ECE Distinguished Lecture Series in Lehman Auditorium SEH. Nader Engheta is the H. Nedwill Ramsey Professor at the University of Pennsylvania in Philadelphia, with affiliations in the Department of Electrical and System Engineering, Materials Science and Engineering, Physics and Astronomy, and Bioengineering. He has received several awards for his research, such as the 2015 Fellow of US National Academy of Inventors (NAI), the 2015 Gold Medal from SPIE, the 2015 National Security Science and Engineering Faculty Fellow (NSSEFF), etc. 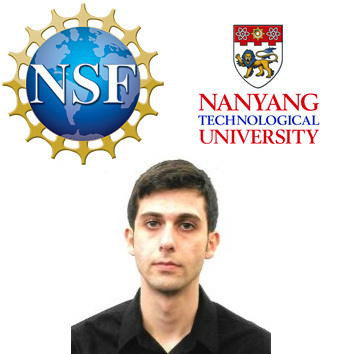 Mohammad has been selected by National Science Foundation to attend the Center for Disruptive Photonic Technologies at Nanyang Technological University during summer of 2016 to conduct research on emission of 2D materials. The Centre for Disruptive Photonic Technologies (CDPT) aspires to be a world-leading player in developing the next stage of the photonic revolution by mobilising the resources and interdisciplinary expertise available at NTU and with our collaboration partners in Singapore, Europe, USA, Australia and Far East, to create a world-leading research activity on disruptive photonic technologies. 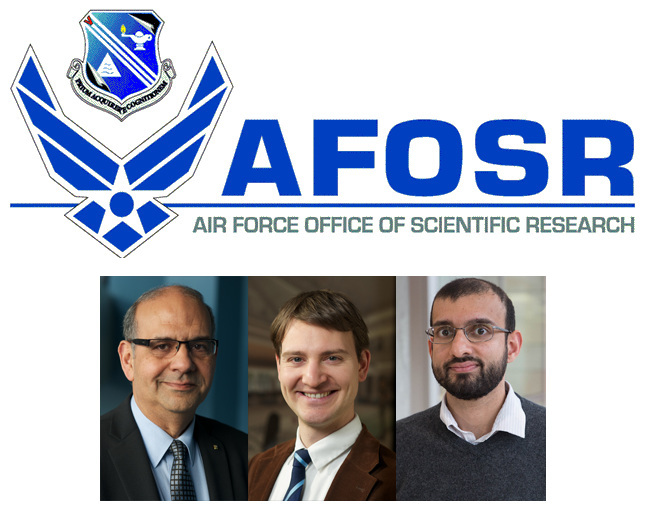 Professors Tarek El-Ghazawi, Volker Sorger and Vikaram Narayana win a competitive AFOSR grant in the amount of $752,193. ​El-Ghazawi is the P.I., Sorger is a CoPI and Narayana the second CoPI. ​The grant is titled "Dynamically Adaptive Hybrid Nanoplasmonic Network on Chips" from the Air Force Office of Scientific Research. This is a 3-year award which started officially on 9/30/2015, for the total amount of $752,193. The underlying project brings together interdisciplinary expertise from Nano-photonics, Computer architecture and High-Performance Reconfigurable Computing to investigate advanced networking concepts in support of future manycore processor chips with substantial energy savings and performance gains. The core ideas are to integrate hybrid nano-plasmonic technology with electric network on chips in a Dynamically Data Driven Application System (DDDAS) scheme which adapts to the varying applications requirements. Shuai Sun won two prices in the SEAS 2016 R&D Showcase. The prizes are 2nd prize of the Theoretical Research Awards ($1,500) and the 2nd prize of the Entrepreneurship Awards ($500). Congratulations! The School of Engineering and Applied Science celebrated its 10th annual SEAS Student Research & Development Showcase on February 24, 2016. More than 100 SEAS students competed for $32,000 in total prize money.